Celebrate the spirit of unity Dec. 15. The kickoff begins at 5 pm. at Unity Fellowship Church at Cicero and Madison, followed by the tree lighting at 6 p.m. in front of the 15th District Police station, 5701 W. Madison. 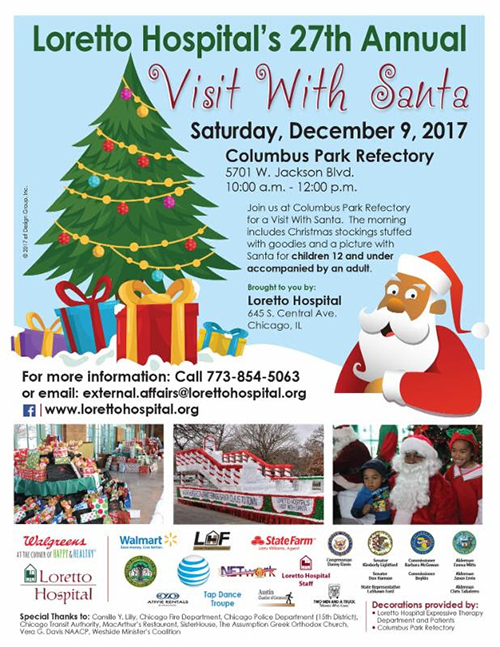 One and all are invited to the hospital’s 27th annual Christmas celebration from 10 a.m. to 12 p.m. Dec. 9 at Columbus Park Refectory, 5701 W. Jackson Blvd.